College. Perhaps one of the most memorable chapters in our life. It’s where we get to live in dormitories, have messy beds and desks, cluttered room, canned foods, etc. It is essentially living without mom and dad to take care of you. But then, this is the part where we actually learn how to live independently. Now, speaking about desks, here’s one cute tutorial about how to make a cute desk that would greatly resemble the one you have in your dorm—messy (just kidding!). Things you must prepare are craft pile wood, glue, ruler and cutter. 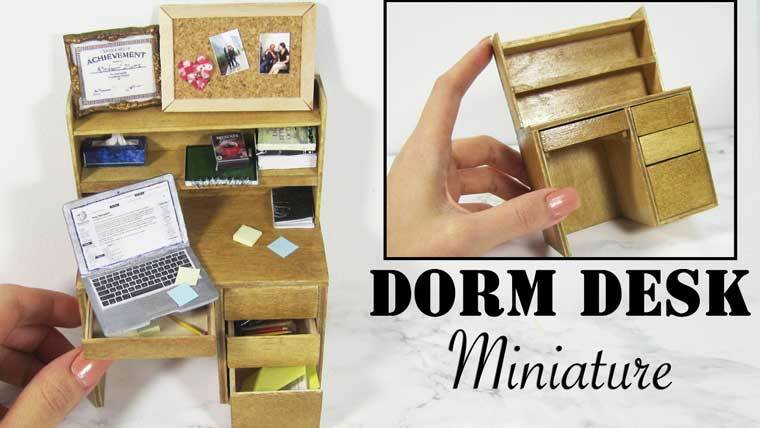 Exact measurements are a must here but it depends on you how small your miniature dorm desk would be. On the other hand, the video below provides specific measurements as a guide. The end product has cabinets, picture frames and even miniature laptop to look like a real desk. Cute! You can paint it too just so you want it to be more realistic and eye-catching. Now, when you graduate and you start miss college, this dorm desk would be a great decoration on your new workplace. Just a cute reminder of your college life.